As much as I love wearing fun springy sandals this time of year, I’d opt for my comfy UGG boots any day! UGG Australia has always been a favorite of mine and since I live in Utah they have been a staple in my shoe wardrobe since I was in middle school! They are my go-to shoe for comfort (you might remember this post from last fall). Even though boots are usually worn in the colder months, there can be some chilly spring days (especially in Utah… you never know what to expect!). I love this pair because the fun serape print adds a cute spring pop of color. And how cute are Isla’s little UGG boots!!!! I never thought Uggs could look so stylish! How cute both of you look!! I like a lot your pink cardigan and those uggs are so original!! Your little girl is such a darling and love your boots, so cute! I’ve never seen Ugg’s like these before! They look so comfy. Also love Isla’s shoes – adorable! Hope you have a great weekend! Those UGGs look so comfy and fun! Love your booth outfits, you’re looking adorable! Your Uggs couldn’t be any cuter! I am just loving the fun colors and fringe! Your outfit looks so comfortable!! I love white and pale pink and it always looks put together, even if it’s just a casual cardigan and jeans. Loving this casual look! And those white pants are kind of awesome, I’d totally wear them day after day too. Isla’s little boots are the cutest! I love the details on your Uggs! It makes the classic ones look more fun! Super cute Uggs! I can’t really think about buying Uggs right now…its blazing hot in Texas! Hah… yes… we’ve seen those white pants a lot. But whatever… if they’re your faves, they’re your faves! Isla’s little UGGs are so cute! Baby shoes are adorable. I really love that sweater! So cute! And Isla’s little boots are so sweet! Isla’s little Uggs are just too cute!! I love the pop of color on your UGG boots! And Isla’s baby UGG’s are just too cute. soooo cute and I love the all white! keep the white jeans coming! I think the pants go nicely with the whole look of both you and Isla, it’s ok to have them on repeat. I love UGG too, and in NYC we’re going to drop in temps this weekend, and I’ll definitely be reaching for my UGGS again. Love Isla’s UGGS, so sweet in baby sizes. Her hair bows are too cute!! Love those white jeans, too! Umm…baby uggs are my favorite!! So adorable!! 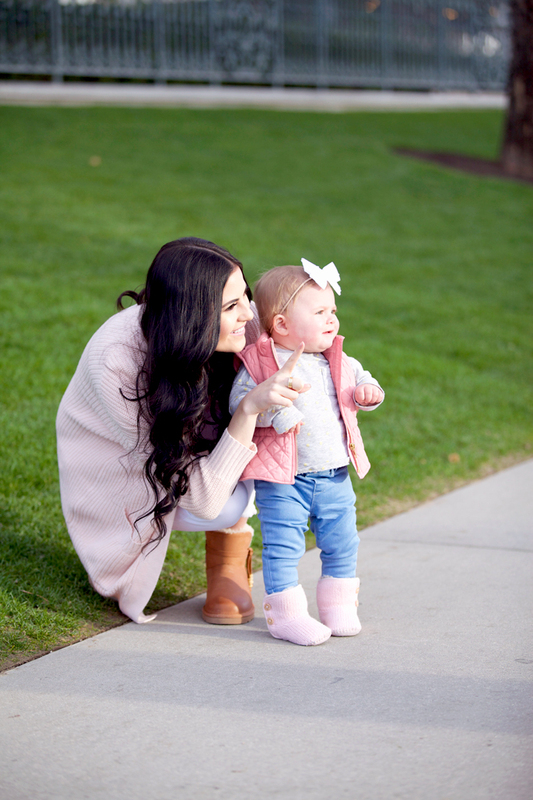 I have always loved my uggs…the baby ones are the cutest thing I have ever seen! Those uggs are super cute! And I love that pale pink sweater! such a cutie!!! love how stylish she already is, but that is no surprise since you are! Those boots are too cute! Love this! http://bit.ly/1To2Fk0 .. dc cherry blossoms! isla’s little boots!! all the heart eyes!!!! Love your boots and the baby is so cute! Two lovely ladies! I love this post. Love the ugg boots, super cute! Have a great weekend. You both look so cute and cosy!!!! And I am just becoming more and more obsessed with those jeans, they look amazing with everything you’ve styled them with, I need to get a pair now!!! I’ve been viewing your blog for about two years now & it been great getting to watching your family grow. It’s always great being able to view your posts on your website as well as you’re Instagram, but I have to say, I love your snapchat the most!! I don’t know you personally but I can tell what a genuine person you are in the tiny unedited videos. It breaks my heart that you are have to defend yourself as a mother from people who like to make a big deal about you editing your photos- (I don’t care what anyone says, I adore that photo of you & Isla). Isla is a beautiful & happy baby girl & I think that means you’re doing your job right!! Where are your white jeans from? wonderful pics… you both look amazing ! Oh my goodness, I love your matching pink looks! So sweet! I love the Uggs! So cute! Love the UGGS! Those UGGS are way too cute on Isla! And I like that you wear the same piece of clothing over and over. It gives me different ideas on ways to wear those white pants for example. That sweater looks so unbelievably cozy & I’m in love with that perfect blush colour! Plus those ugg boots look like the warmest boots around! Such a sweet post! I love those UGGs on Isla!! Love love love! I need that sweater in my closest! Isla’s Uggs are so cute. I’ll have to get those for my niece! So cute! Love! Isla’s Uggs are so adorable. i’ll have to get those for my niece! You both are so cute in your UGGs! Those baby pink uggs are the cutest! !